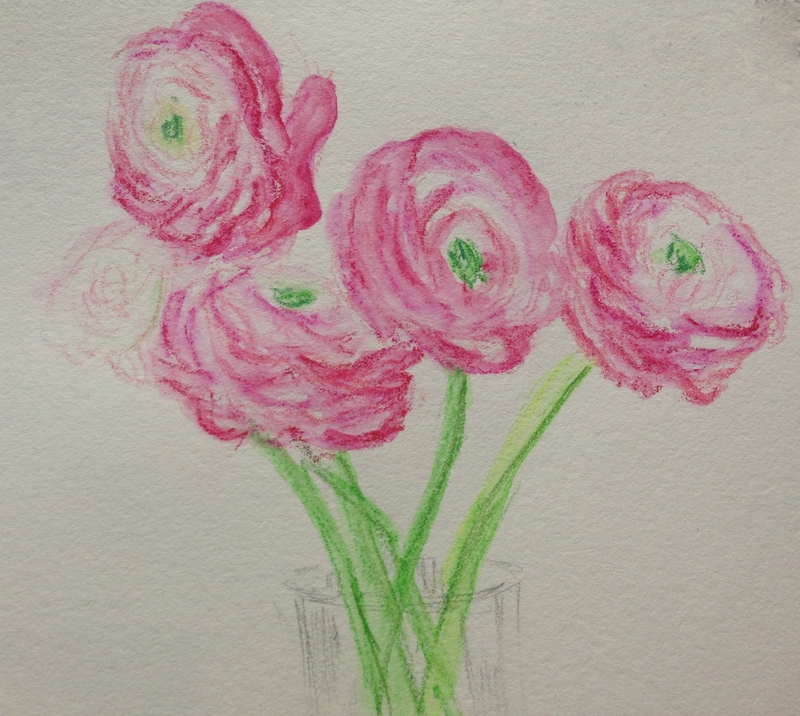 I saw Cathe’s Valentine’s Day post over at Amaryllis Log recently and just had to try to capture the essence of her beautiful flowers in my art journal. 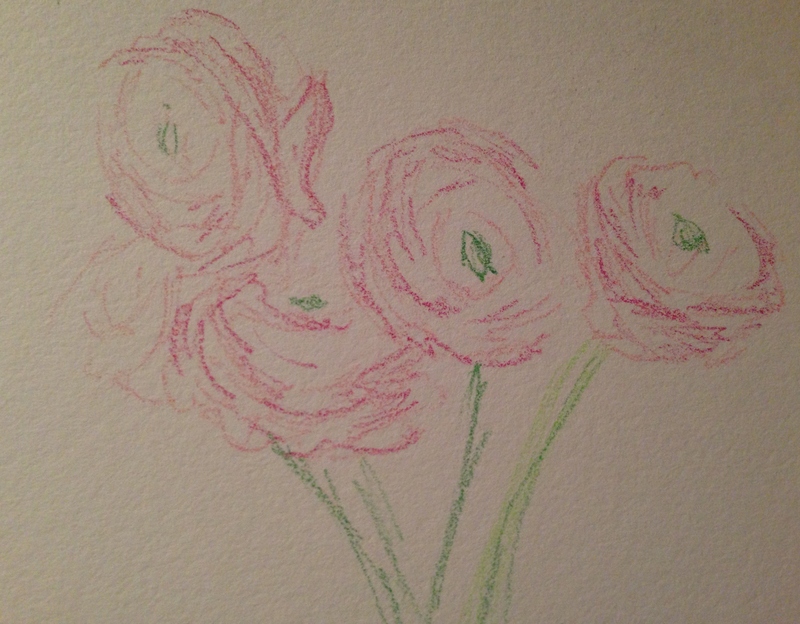 Lately, I’ve been fascinated with Neocolor II water-soluble crayons. I realized I’ve not done much realistic work with them, and thought I’d try to remedy that. This ^^ is just the initial sketch on the page, before brushing with any water. 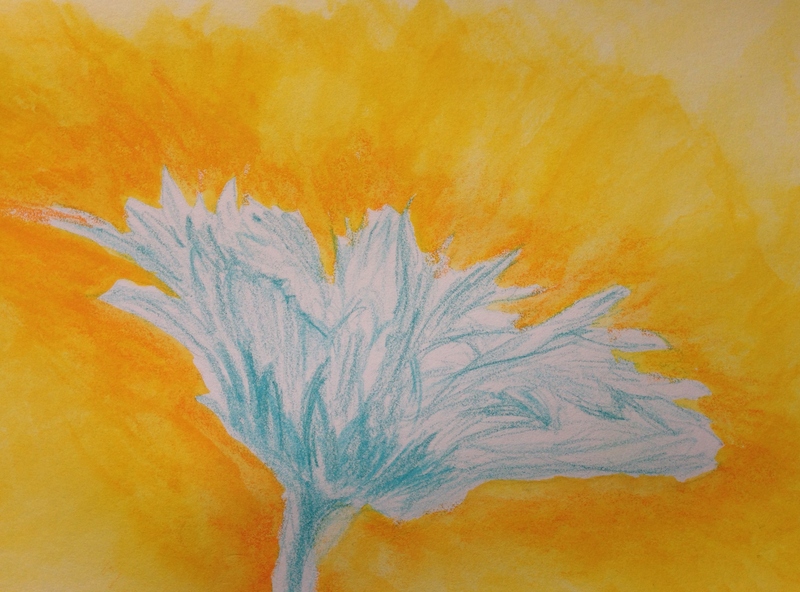 The nice thing about sketching with a water-soluble medium is that the drawing will be melting into the painting. Amazing what the water does to the initial sketch! After liquefying the initial color, I did go back and add just a bit more to darken my dark values. I was pleased with the end result. I just can’t resist this medium! The ease, control, buttery softness, and vibrancy of color all make them a real pleasure to work with. I think what I love most is that they help me to quickly capture my feelings as I look at my subject. I can easily lift out color after liquefying if I’ve gone a bit too heavy with the initial sketch, and in no time at all, I’m finished! And at the end of a long day…..that’s often exactly what I’m looking for. 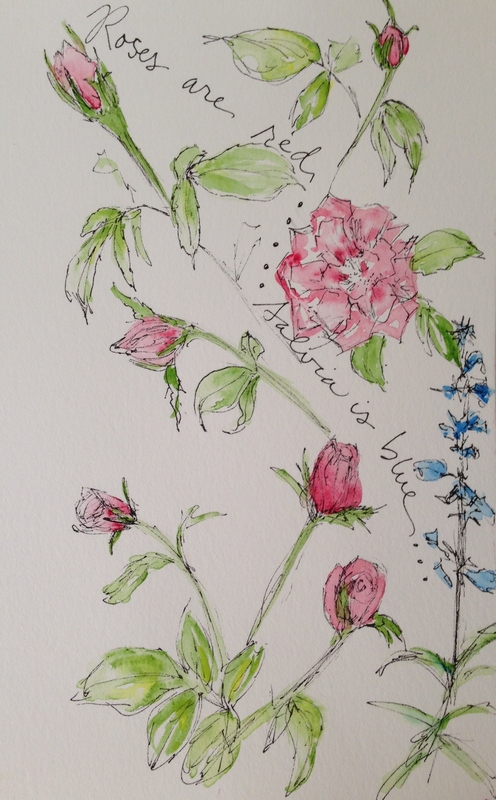 Thanks again, Cathe, for sharing your lovely photo! Happy Tuesday, and I hope you have time to exercise your art muscles today! Peace. So many artists (including artists with lenses and letters and others) inspire me here. Debi Riley is a gracious, informative, generous and gifted artist of many talents; one of them is photography. 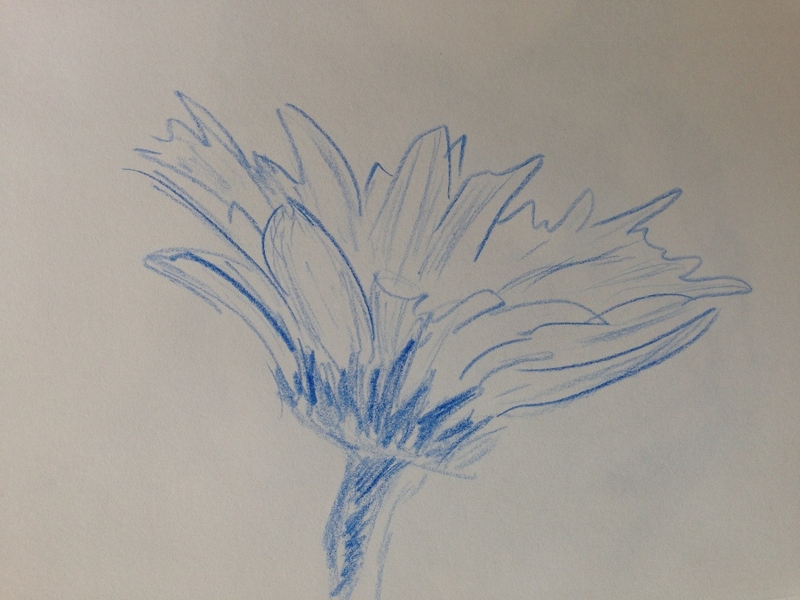 I was recently moved by a black and white photograph of a flower she posted on her blog. 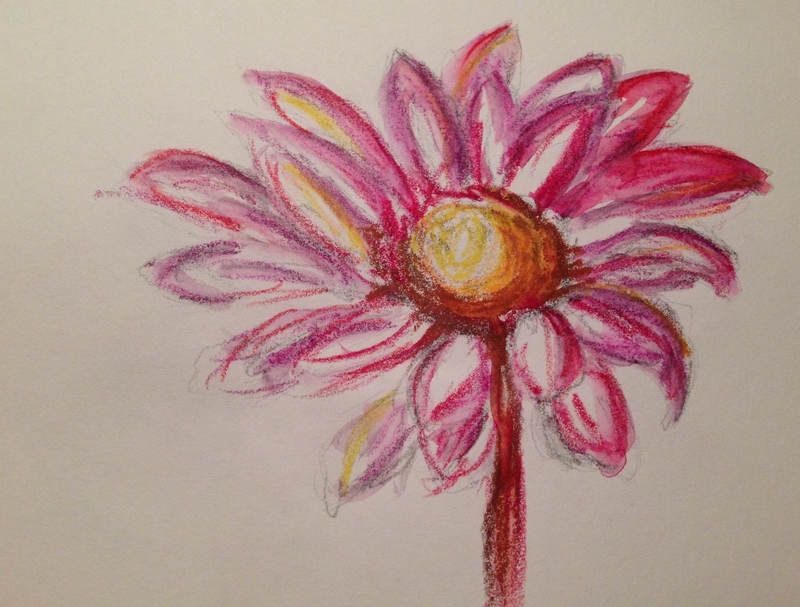 I tried it in pencil first…….then moved to Polychromos colored pencil…. 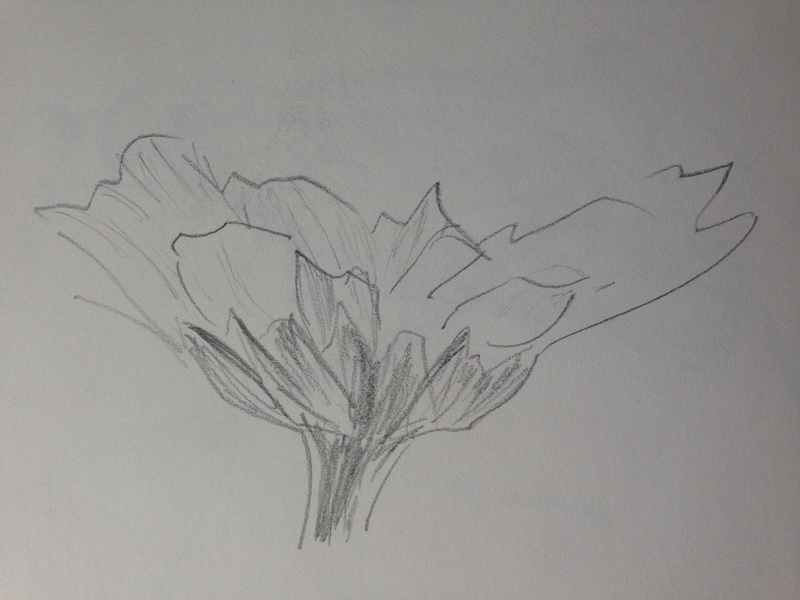 Once I started sketching it…..I didn’t want to stop! Of course, cobalt teal (or something close) was a must, as I wanted Debi to smile when she saw my painting. 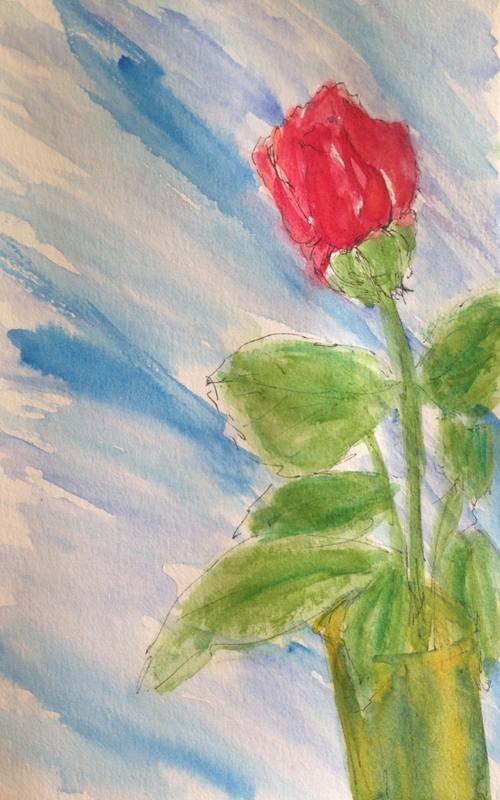 🙂 As Debi’s post explains, this is a wonderful exercise in looking and really seeing the flower. Although I wasn’t aiming for precision, I do find it interesting how much my ability to really see increases with the number of drawings (of any type) that I do, and in particular, with the number of times I work with a particular subject. 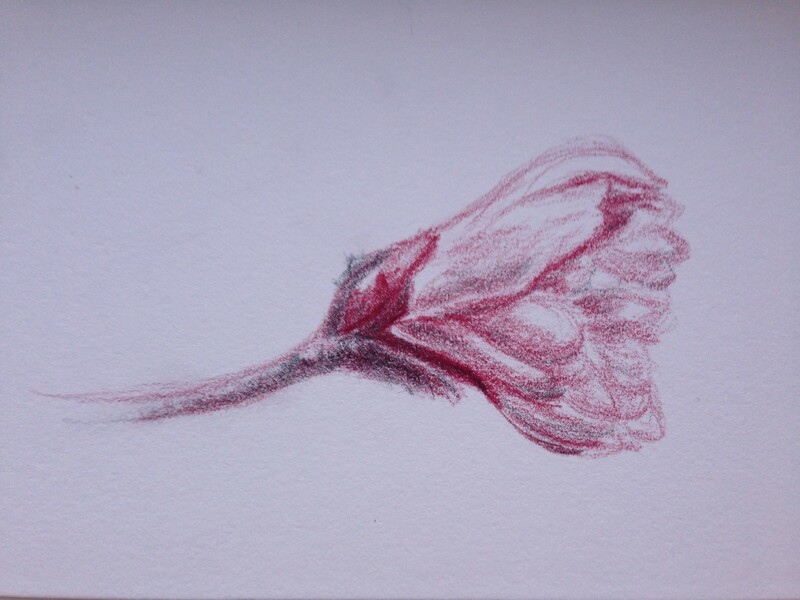 I could sketch this flower ten more times, and each time, I would see something I didn’t see before. This final one was sketched in Polychromos colored pencil, then surrounded by three shades of luscious Neocolor II water-soluble pastels. IMO, this is a must-have art supply. 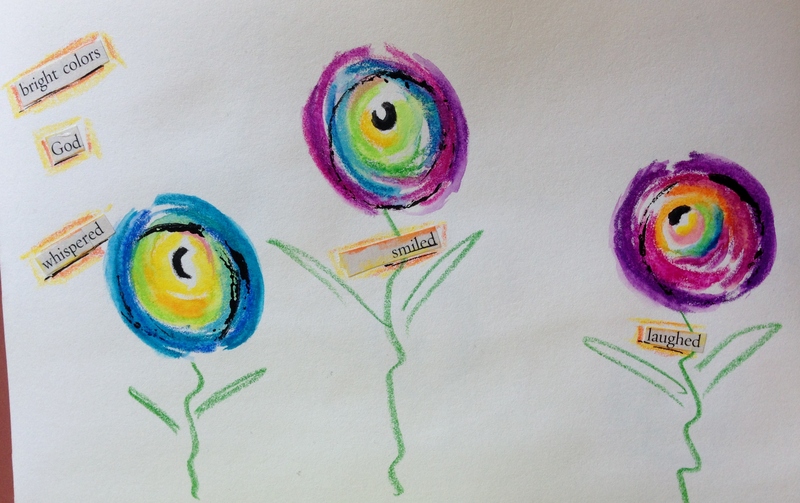 If you buy a set from Blick, you can return it for up to a year – no questions asked. Who offers this?! Right. That’s why I love Blick! It’s well worth at least trying them out. They are so vibrant, creamy and buttery. I could have blended them more and you’d have never known they were anything but paint, but I kind of like this image as it is. It was just me playing and having fun. Please do check out Debi’s blog, as I promise you will learn something new every time you visit. Plus, she will inspire you out of your socks! Always! I hope everyone is getting ready for Draw A Bird Day tomorrow, this time over at Kerfe & Nina’s place (Method Two Madness). I better get flapping on that myself! Peace (and pigskins) to all! Just another quick one from my art journal. We had a couple of new little buds, one each on the red and pink bushes. 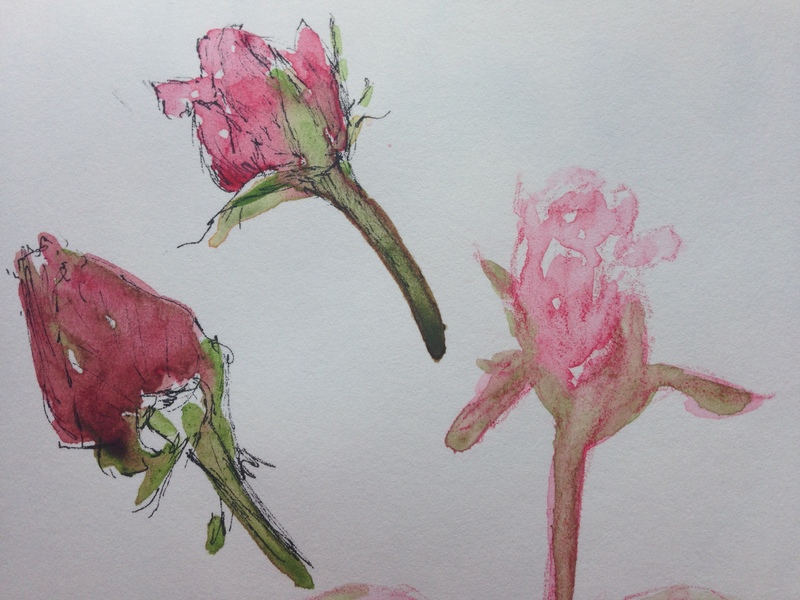 So I decided to sketch them both in ink and go back in with my Cotman watercolor travel palette. 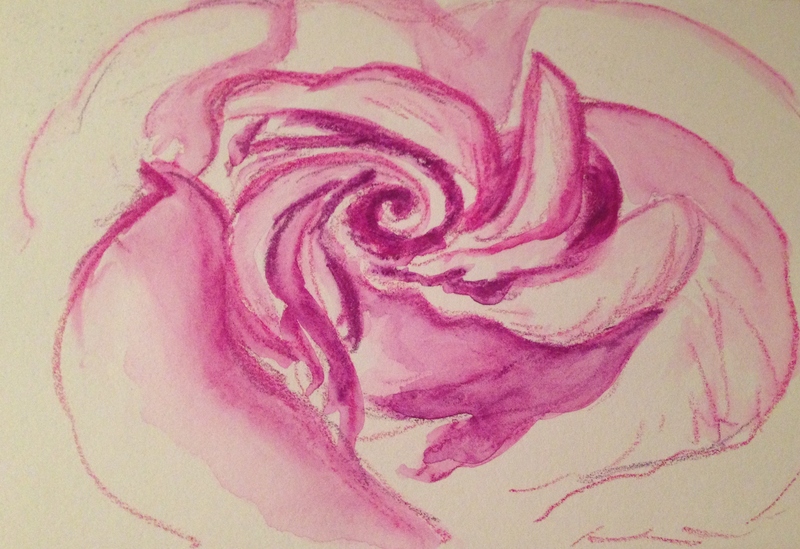 The other rose was my warm-up in Inktense pencil with a bit of watercolor paint added later. That ink definition adds so much! Happy Thursday to all…..Anyone else looking forward to some fall-like temps? Can’t wait. Peace.